Rest in peace, Batfleck — long live BatHamm? The same day it was reported Superman actor Henry Cavill was ditching his cape and Batman star Ben Affleck was likely "segueing out" of Warner Bros.' DC movie universe, Mad Men alum Jon Hamm threw his hat in the ring of stars who could succeed Affleck as the Dark Knight. Speaking with television sports reporter Graham Bensinger on an episode of his eponymous interview series In Depth with Graham Bensinger, Hamm revealed that he's interested in playing Batman, as he's been a comic book fan since he was young. However, there's one condition that a project featuring Hamm as the Caped Crusader must meet. Hamm explained, "It depends on the script, what the story is." "I am a huge comic book fan, always have been. I've read comic books since I was 9 or younger. And I'm pretty knowledgeable about a lot of them," Hamm continued, adding that he likes the genre, especially when the movies are "done well." The Tag star then stated that he'd "probably fit the suit" — he and Affleck share a similar physical build and are roughly the same height, with Affleck standing only two inches taller than Hamm — but admitted that he would "have to work out a lot," which he isn't exactly thrilled about. 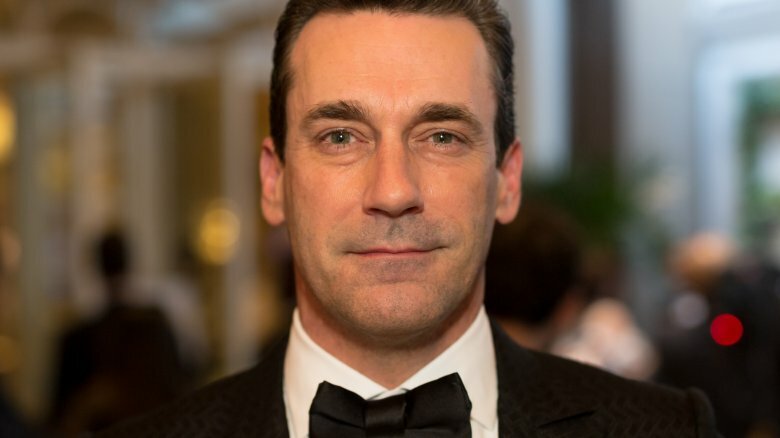 Addressing past chatter that he would make a wonderful Bruce Wayne, Hamm mentioned that he's heard rumors "since probably season one of Mad Men," which debuted over a decade ago in 2007. But don't start making fan art of Hamm as Batman just yet, folks — the actor quickly followed that he has "never had a conversation with anybody about it, literally" and has never been in serious negotiations to play Batman. "I've sat in the room with all these guys. I have never been offered anything. I think the internet wants what it wants," he said. "But, I mean, a lot of people have to sign off on that, obviously not just the internet." Ultimately, Hamm is confident that he could bring to life a fresh and intriguing iteration of the hallowed vigilante — so long as the powers that be want him to take the torch from Affleck for a future film. "I am sure there's an interesting version of that being out there," said Hamm. "And if they wanted to tap me on the shoulder and ask me to do it, why not?" Hamm's comments to Bensinger here come after RadarOnline.com posted an article back in December of 2017 that alleged Hamm was "gunning hard for the role" of Batman amid complications behind the scenes of director Matt Reeves' The Batman, the film meant to star Affleck in the title role. "Jon knows Ben has faced some criticism over Batman v Superman and Justice League, and frankly thinks he'd be better suited for the job. This is business for Jon — not personal," an anonymous source shared with the outlet. "Jon's desperate for the gig — friend or not … Matt thinks Jon is charming and was a big fan of Mad Men, so it seems like a great transition to him." Absolutely nothing is set in stone regarding Hamm's potential connection to the character of Batman, and Warner Bros. hasn't made an official comment on Affleck's rumored departure from the DC Extended Universe, so fans would do well to reserve their excitement for the time being. Still, there's no denying that Hamm would make a damn fine Batman. The same guy who played the wealthy-and-troubled-beyond-belief Don Draper on Mad Men playing the equally well-to-do yet perpetually haunted Bruce Wayne? It seems a perfect fit, but only time will tell if BatHamm will become a reality.